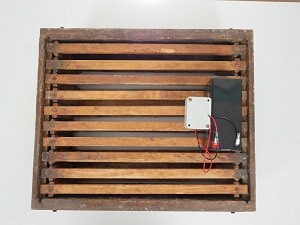 Place the "Varroa-Killer-Sound" directly over the combs in an empty frame (like shown in the pictures). Treatment should be done two times every year. Optimal moment is, when bee colony has about two frames, so the accoustic pressure reaches the bottom of the hive. But even in summer, when there are honeyframes at top of the hive, "Varroa-Killer-Sound" is useable. Ultrasonic does not harm the honey! Because of the longer distance to the brood, the effect is only about 90%. The frequency of 14.500 – 15.000 Hz with 90 Dezibel is audible for people with a good sense of hearing, especially children! Outside the hive its just 30 Dezibel. Beekeepers, who are able to hear this frequency should use earplugs while working on the bees with the "Varroa-Killer-Sound"
By the departure of bees from strange, varroa-loaded colonies it can come to reinfection of the treated hives, if not all hives at the same yard are treated at the same time. This is especially the case in the autumn when strongly weakened colonies break down. At this time we recommend a treatment of all colonies at the same time. In principle you can treat with one device (two applications in the year) 6 hives. 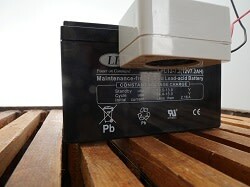 "Varroa-Killer-Sound" includes a rechargeable dry-cell battery (no risk of leaking battery acid!!! ), sufficient for a 40-days treatment .